Links to statistics for the tournament are available at the bottom of this post. If you are interested in attending a future version of this tournament please get in touch through email at contact@quizbowl.co.uk or through Facebook or Twitter. 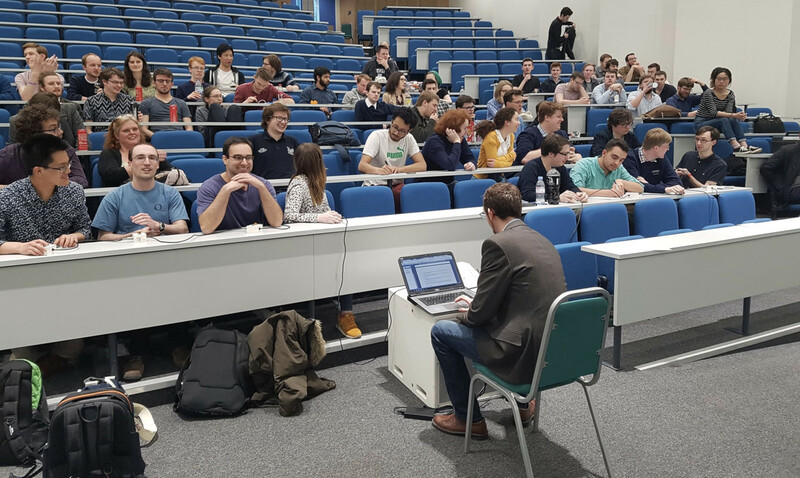 The 2018 edition of the British Student Quiz Championships was held at Imperial College, London, on the 5th May and the tournament continues to go from strength to strength. Amongst the scenic surroundings of Albertopolis and the UK headquarters of the Church of Latter Day Saints, a huge field of 22 teams put their fingers on the buttons for a scintillating day of quiz. Cambridge A emerged victorious after a hotly contested day of quiz but the standard of the field across the board suggests that they are unlikely to be beginning an era of the sort which Oxford had established over the past decade. Several teams made their tournament debuts this year, including QMUL and Leicester. Another promising debut came from Joe Bath, who led Manchester B scoring over 40 starter points per game, while Joe Middleton-Welling and Johnny Davidson also made confident debuts performing at this level. A team unlikely to make a return to future editions of the tournament was Gloxhampton, a composite team of Glasgow, Oxford and Southampton students. While their exact heroics will not be repeated in the future, there is every hope that hybrid teams continue to present an opportunity for individuals who have not been able to muster teams to play major tournaments like this. Cambridge B had a successful tournament led by rising star Joseph Krol, the highest scoring undergraduate, including running defending champions Oxford A to within 5 points, the closest possible defeat. Evan Lynch, representing Southampton this year after two years of heartbreak playing for Cambridge A, found his teams hopes once again dashed by Cambridge C, also coming unstuck against traditional powerhouses Oxford A and Cambridge A. An exciting forerunner to the final was a tiebreaker between Oxford Brookes and Manchester. Brookes stalwart Tom De Bock buzzed in on a history question and managed to save himself mid flow from picking the wrong regnal number for the hero of the Glorious Revolution with the inventive answer “William the… of Orange”. The inventive answer paid off, however, with Brookes emerging victorious to win that game in front of a large audience. In a reverse of the top bracket round robin results from the previous two years, Cambridge A were defeated by Oxford A (Daoud Jackson, George Charlson, Jacob Robertson and Alex Peplow) by a score of 435 to 235, meaning that Oxford A held an advantage of one game going into the finals series. After a slightly dicey victory in the first finals game, Cambridge A triumphed in the second finals game to defeat Oxford A, ending a decade of Oxford holding the title, and taking home the trophy for a first time. Congratulations to Ellie Warner, Sam Cook, Jason Golfinos and Yanbo Yin on their achievement. An enormous thanks is due once again to Edmund Dickinson for adapting the NAQT Sectional Championship Tournament set and to his team of Briticizers and writers (Afham Raoof, Alex Bubb, Ben Salter, Bob De Caux, Charlie Clegg, David Knapp, David Stainer, Ewan MacAulay, Hugh Bennett, Hugh Binnie, Ian Bayley, Jonathan Elliott, Joey Goldman, Kyle Haddad-Fonda, Luke Pitcher, Max Espensen, Michael Levy, Peter Sloman, Sam Swift, Sasha Taromsari, Stuart McLachlan, Thomas Grinyer, Tom Speller) and moderators (Hugh Bennett, Sean Blanchflower, Francis Clark-Murray, Charlie Clegg, George Corfield, Chris Ducklin, Jonathan Elliott, Max Espensen, Joey Goldman, Emma Laslett, Matt Loxham, Ewan MacAulay, Katie McGettigan, Afham Raoof, Ben Salter, Tom Speller, Simon Spiro) for a largely faultless tournament. The organization of these events takes a prodigious amount of effort and the commitment of so many people to give up spare minutes and Saturday afternoons is what keeps this tournament on its feet. Links to the statistics are the following: prelims; playoffs (with contributing morning games); all games. The questions used are not publicly available, but if you would like information on how to purchase them then please email contact@quizbowl.co.uk.